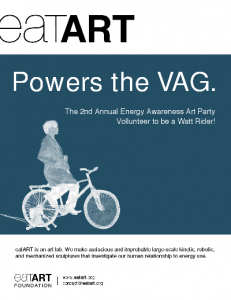 eatART will present its 2nd annual green powered Energy Awareness Art Party. Expect to see giant kinetic sculptures, loads of bicycle enthusiasts and an unforgettable outdoor dance party. This event will be powered with solar **and** pedal power. On June 27th, 2010, eatART takes over the Vancouver Art Gallery Lawn to top off its annual energy awareness and fundraising event. Throughout the 9 hour event, there will be 8 teams of three “watt-riders” who have collected “energy pledges” that will be powering the pedal-powered sound system. In tandem with this energy source, an array of solar panels will also be powering the tents and info booth. What is a “Pedal Powered Sound System”? Simply, it is a DJ station that is powered by three riders and their bikes. The riders pedal with their back wheel resting on a spinning mini generator that is connected to the sound system. The boomin’ soundsystem is controled by a DJ who can spin records with energy aware panache. How do I get a chance to power the party? Why would I want to “raise watts”? Besides the obvious magnificence of raising watts for a human and solar powered dance party, you will also be raising funds for the eatART Charitable Foundation!